Box 35 of 51, Center for Migration Studies, New York, NY. There have been several instances of impeachment charges against Presidents in office. On February 24, 1868, President Andrew Johnson was impeached for high crimes and misdemeanors by Congress (Trefousse 1997). However, he escaped removal of office by the Senate on May 26, 1868 (Trefousse 1997). On December 19, 1998, President Bill Clinton was impeached on the counts of grand jury perjury and obstruction of justice by Congress. However, he was acquitted by the Senate on February 12, 1999 (Hayden 2002). Efforts have also been made to impeach President Donald Trump. Since early into his Presidency, organizers have tried to build a case for impeachment based on Trump’s insistence on maintaining ownership of his luxury hotel and golf course business while in office. Ethics believe that this could lead to constitutional violations and undermine public faith in his decision-making (Gold 2017). The artifact selected for this blog is a postcard from the Cline Collection at the Center for Migration Studies in New York City. Dr. Mary Brown, archivist for the Center, explained that Mr. Garner J. Cline donated several boxes of documents, such as photographs, letters, hand-written notes, and correspondence with constituents, politicians, and other prominent government officials. The postcard, addressed to Garner J. Cline, is related to the impeachment proceedings against President Richard M. Nixon. Mr. Cline, staff director of the House Judiciary Committee (The Morning Call 1990), was a chief advisor to Congressman Peter Rodino, the Committee Chairman who oversaw the impeachment process against Nixon (Kaufman 2005). 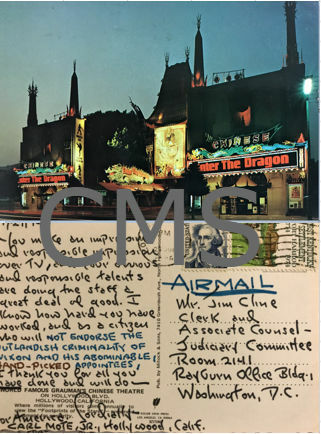 The postcard was a note of support for Mr. Cline and his work with the House Judiciary Committee. In July of 1974, The House Judiciary Committee voted to recommend the impeachment of President Nixon for engaging in a “course of conduct” designed, to obstruct justice in the Watergate case. They included accusations that Mr. Nixon had made “false or misleading statements” to investigators, had concealed evidence of criminal wrongdoing, had counseled associates to commit perjury, had misused sensitive agencies of the Government and had approved or allowed the payment of hush money to convicted criminals (Naughton 1974). As a mission of St. John’s University is to search out the cause of poverty and social justice and to encourage solutions that are adaptable (St. John’s University 2018), I believe Mr. Cline and the Hose Judiciary Committee exemplified this mission. In a discussion on October 8, 2018, Dr. Brown explained that the committee was insistent on building a case against the President for his impeachment. Many believed that this was a case of the liberal Democrats going after the conservative Republican. However, it is my belief that there was a case in progress to bring a leader believed to be corrupt, dishonestly, and under serving the people he was elected to govern, to justice. Gold, Matea. 2017. “The Campaign to Impeach President Trump Has Begun.” The Washington Post. January 20, 2017. https://www.washingtonpost.com/news/post-politics/wp/2017/01/20/the-campaign-to-impeach-president-trump-has-begun/?utm_term=.8e7e6a7d9120. Hayden, Joseph. 2002. Covering Clinton: The President and the Press in the 1990s. Praeger Series in Presidential Studies. Westport, Conn: Praeger. Kaufman, Michael T. 2005. “Peter W. Rodino Dies at 96; Led House Inquiry on Nixon.” The New York Times. May 8, 2005. https://www.nytimes.com/2005/05/08/nyregion/peter-w-rodino-dies-at-96-led-house-inquiry-on-nixon.html. Naughton, James W. 1974. “A Historic Charge.” The New York Times. July 24, 1974. https://www.nytimes.com/1974/07/28/archives/a-historic-charge-two-more-articles.html. St. Johns. University. n.d. “Our Mission.” Accessed October 14, 2018. https://www.stjohns.edu/about/our-mission. Trefousse, Hans Louis. 1997. Andrew Johnson: A Biography. Reissued. New York: Norton. This entry was posted in Center for Migration Studies of New York and tagged Center for Migration Studies, Garner J. Cline, House Judiciary Committee, Impeachment, Peter Rodino, Richard M. Nixon, Watergate. Bookmark the permalink.